The theurgic work of the Knight Masons Elus Cohen of the Universe or Kohanim in Haiti not only contributes to the content of the hybrid Haitian Rite, but it forms the substance of the Saint Johns Day midsummer traditions of the lodges under the mainstream Masonic authority of the Grand Orient d'Haiti, founded in 1824 after seventy five years or more of Masonic presence in the form of British and French lodges founded by aristocrats. These Masonic observances involve a central fire lit after dark, and they are strikingly similar to the bonfires of Europe. With the syncretic nature and history of Haitian culture, it is likely that some part of the Saint Johns Day ceremonies observed by Freemasons in Haiti does originate from the European landowners of the 18th Century. Certainly, it is men like Martinez de Pasqually and Estienne Morin who helped shape Freemasonry in Haiti in the later half of the 1700's. 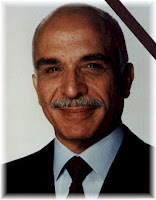 Pasqually ultimately passed away in Haiti where he was buried in a Catholic cemetery and given his Elus Cohen Masonic funerary rites by the brothers of lodge of Elus Cohen he had founded and left in the care of his cousin Armand Cagnet de Lestère in Leogane, Haiti. When Armand Cagnet de Lestère died in 1778, Sebastian de las Casas took over as Grand Sovereign. On Saint Johns Day in Haiti, there is a Masonic ceremony that is community oriented. Even in the Brooklyn neighborhood of East Flatbush, one can observe this remarkable tradition as it is carried out by Haitian Masonic lodges in the middle of the street. 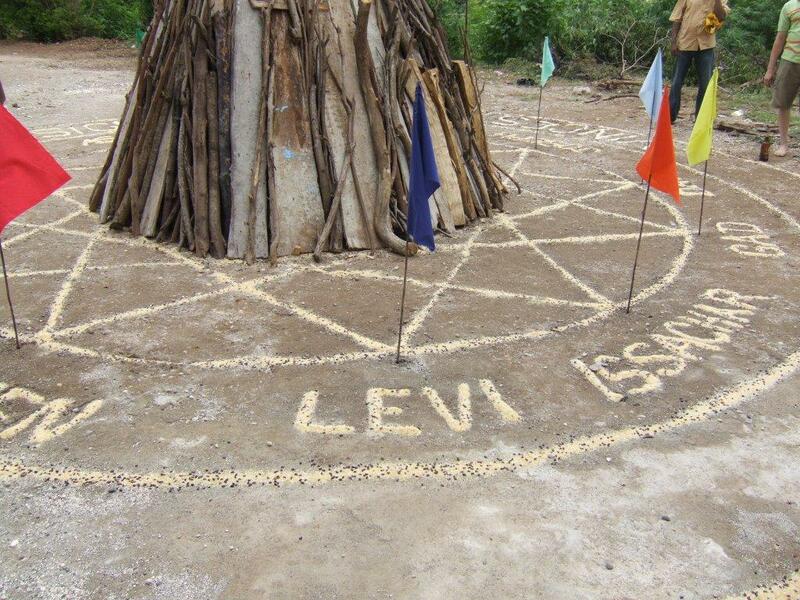 The grounds outside of the lodge are consecrated in advance, and they are marked with consecrated chalk, inscribed with various sigils and the colored divinatory banners and Angelic names of the 24 Elders, and the circles are traced with with circles of retreat for the officiating Masons of specific degrees. This sacred space is treated with reverence by the Masons, as it is Holy ground in their eyes. The Brethren open lodge inside their temple in the usual manner and then proceed in a procession with banners of the Knights Kadosh, the Knights Templar, the craft lodge and the Knight Masons Elus Cohen. The members of these various bodies of Masonry are in their regalia. Occasionally in the midst, one might spot a Grand Master Elus Kohen or an elderly Reax Croix in his foot high band of fire around the bottom of his alb. The procession goes down the rural hillside into town where the streets and balconies are packed with onlookers, some hurling prayers for loved ones, written on parchment, into a large basket carried by a Rose Croix Mason. The procession is circular and returns to the point in town where the Freemasons had entered, this time with family, friends and townspeople in tow. They return to the lodge grounds and methodically step into their stations and places around the circles. The profane form the outermost circle around the outer circle of Master Masons clothed in their regalia. Haitian Freemasons in priestly albs remove their shoes and carefully enter the circles, a select few approach the altar of wood and proceed to sprinkle it with specially prepared spirits, Florida water, champagne, Holy Water, sea salts and the like. There are offerings of Rum and Coconut water, Purifications of Palm and Olive oil, Perfumes and libations. The prayers collected in town are stuffed by the Preparing Brother of the lodge into center of the bundles of wood forming the altar, which the Haitian brethren refer to as "the Ark". A special mixture of incense is burned in a thurifer. The Venerable Master, Wardens and Orator each invoke specific Angelic intelligences . The nine choirs, the Archangels, Thrones, Dominions, Principalities, Seraphim and Cherubim are all invoked. There are formulas and appeals, ceremonies and prayers that would be familiar to anyone who has read Piers Vaughan's translation of Robert Ambelain's Practical Kabbalah. After a series of prayers and the tracing of sigils, calls and responses, there is a final censing by the Thurifer. The Ark is lit by a single flame. The brethren join in a very large chain of union that takes on a motion and song with a crescendo like finish after many spirited circumambulations in fervent unity. In his classic work Ecce Homo, Louis Claude de St. Martin (who belonged to the Masonic Lodge Benevolence in Lyon and was both a Secretary to Don Martinez de Pasqually and a “Sovereign Judge et Superièur Inconnu de L’ Ordre”) wrote that the early Christian priests had four powers: make the Lord's Supper, to forgive sins, heal diseases and know the mysteries of the kingdom of God. He believed that Modern day priests today have actually only retained the first two. Ordinary priests were in his eyes, like officers in the Lodge of Saint John who had lost the password, as they say. 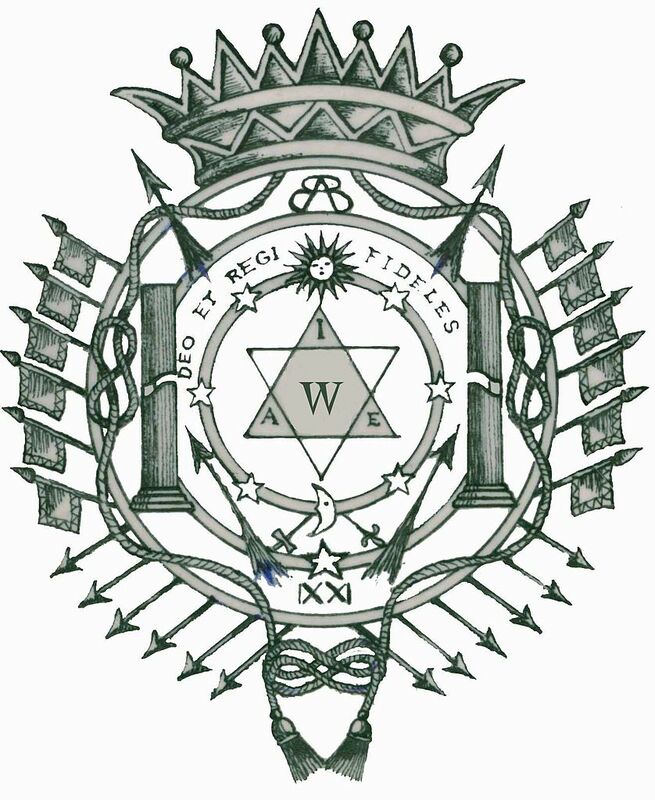 In Haiti, the priest class is the Ne Plus Ultra level of Freemasonry. 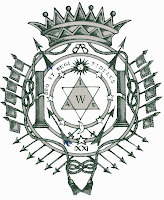 Their approach to Freemasonry is altogether magical and theurgical and quite serious in manner, as they are carrying out the work of the Treatise on the Reintegration of Beings, the magnum opus of the founding Grand Sovereign of the Order. I would love to see a COMPLETE display of the "Colored divinatory banners" for the Angelic names of the 24 Elders. However the names of the Elders do NOT match in the two graphics used as illustrations here (the partial color photo, and the small black & white inset); and almost NONE of them are even INCLUDED in the Elus Cohen "Table Alphabetique des 2400 Noms": Kindest thanks for any additional clarification and information about this!